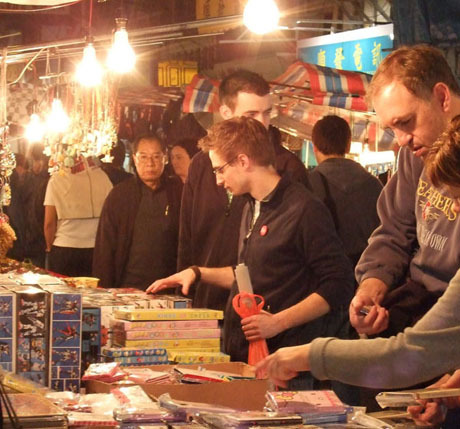 This day market is on most visitors list of "must do's" in Hong Kong and is a little more “up market” than most other street markets in Hong Kong with some good quality merchandise. The market comprises mostly walk-in shops in narrow alleyways which spill out onto to the pavement during opening hours by putting stalls out in front. 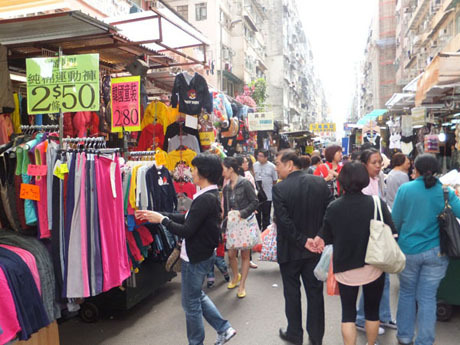 Whilst most shops allow bargaining, discounts are usually not on the same scale as some other street markets in Hong Kong. Shops offer a wide variety of clothes, footware, sportswear, jewellery, Chinese silk garments, paintings and artwork, toys and souvenirs. 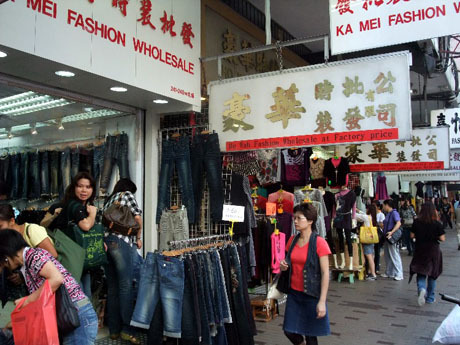 Some genuine designer fashion brands are available at this market but may be imperfect "seconds" and there are also outlet shops selling factory overruns and surplus stock. Some shops specialise in large size clothing and footware which can be difficult to find elsewhere as many shops in Hong Kong stock only smaller Asian sizes. The market can become congested at weekends and during public holidays. The market is located in STANLEY, a scenic seaside resort on the south coast of Hong Kong Island, which is a popular tourist destination in its own right. Attractions include beaches (Stanley Main Beach and Stanley St Stephens Beach), waterfront promenade and boardwalk with shops, restaurants and cafes, temples, Murray House, Stanley Plaza, Hong Kong Correctional Services Museum, Stanley Ma Hang Park, Stanley Military Cemetery are of which all within walking distance of the market. Hong Kong Maritime Museum, which was located in Murray House, closed on 4th June 2012 and was relocated to much larger premises at Central Pier 8, where it reopened in early February 2013. OPENING HOURS - shops open from 9am (some shops open later) to 6/6-30pm daily. Hong Kong’s largest night market is located in the Yau Ma Tei and Jordan area of Kowloon and runs almost parallel to the western side of Nathan Road. The market which takes its name from the Tin Hau Temple which it bisects from north to south. Since the 1920's local residents had gathered under the shade of a large banyan tree in front of the temple, which soon attracted hawkers and local performers such as opera singers and martial arts exponents. In 1968, a site by the temple was given over by the government to the increasing number of hawkers, and was divided into stalls each measuring 3' x 4'. People wishing to start a business were required to join a public ballot and given a drawn number, which enabled them to set up a stall on the site. In March 1975, owing to increased demand, the site was extended to include Public Square Street, Nanking Street, Man Ming Lane and the area around Yau Ma Tei Public Library. Visitors should note that the market extends along both sides of the Tin Hau Temple and public square in Public Square Street. 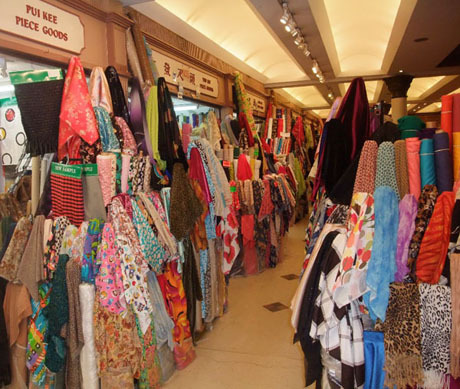 The market is also known as “Mens Market” as it targets male customers and offers a huge range of tacky and often counterfeit goods including clothes, bags, lighters, watches, artwork, CD’s and DVD’s, toys, electrical goods, jade, footware, household goods and souvenirs. Here nobody expects to pay anything like the marked prices and it is quite normal to "bargain" down to half the asking price. 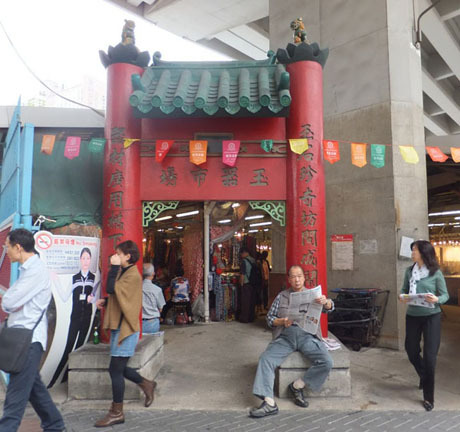 In the section of the market from Public Square Street towards Jordan Station can be found fortune tellers, palm and face readers and tarot card readers who, for a small sum offer to look into the future, and groups of Cantonese opera and, occasionally Western, singers and musicians. Performances are free for casual bystanders although donations are requested and each group usually has a sitting area close to the performers, popular with photographers, for which a small charge. Cantonese opera performances do not usually take place when there is night racing at Happy Valley. There are also bargains to be had in the shops lining either side of Temple Street and food outlets including dai pai dong's along the street and cafes among the shops behind the stalls. OPENING HOURS - Stalls are allowed to open from 2pm but most do not set up until from 4pm onwards and the best time to visit is from 7pm onwards. Most stalls close between about 11-30pm and midnight. Closed on the first day of Chinese New Year. GETTING THERE – MTR to either Jordan or Yau Ma Tei. From Jordan MTR Station take exit A and at the top of the steps at street level turn right along Jordan Road and Temple Street is the third street on the right. The market starts about 150 metres down the street. From Yau Ma Tei MTR Station take exit C and at the top of the steps at street level turn left along Mang Ming Lane and Temple Street is the second street on the left. Over 50 shops with stalls spilling out into the street provide a colourful display of blooms and plants of all varieties. 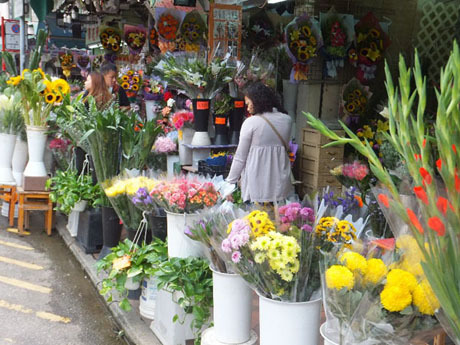 The Flower Market located in Flower Market Road, Prince Edward Road West, Sai Yee Street and Yuen Po Street is probably not worth a visit in its own right unless intending making a purchase but the adjacent bird garden makes an interesting combination of attractions. In the 1960's, a dim sum restaurant on Shanghai Street in Mongkok became a popular venue for bird lovers who took along their caged birds and listened to the birds singing, whilst dining. Before long, hawkers selling bird feed set up stalls by the restaurant. When the restaurant was demolished the hawkers moved to a nearby side street, Hong Lok Street, and the number of hawker stalls grew to over 80. The street was later named Bird Street and became a popular tourist attraction. In December 1997, owing to urban renewal, the hawkers on Bird Street were relocated to the new Bird Garden on Yuen Po Street. 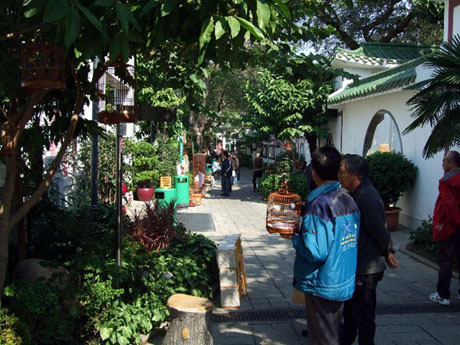 The Bird Garden, which runs the short distance between Flower Market Road and Boundary Street, houses 70 stalls and occupies an area of 3000 square metres. Here, locals proudly take their songbirds for an outing in the fresh air in the attractive courtyards. The stalls selling a large variety of colourful birds including parrots and songbirds, food, cages, feeders and various other accessories. The garden has some interesting architectural features including glazed bamboo-shaped ceramic roof tiles that reflect different hues of sunlight, carvings of many bird species on some 200 marble screens mounted on the perimeter walls and a giant mural carving depicting over 100 birds at the Boundary Street entrance. OPENING HOURS - Flower Market, 7am to 7pm daily, Bird Garden 7am to 8pm daily. GETTING THERE – MTR to Prince Edward. Take exit B1 and follow Prince Edward Road West alongside the flyover past Mong Kok Police Station and continue to the third street on the left. Flower Market Road is a few metres along on the right and runs alongside Mong Kok Stadium. Yuen Po Street where the Bird Garden is located is at the far end of Flower Market Road. In March 1975, 20 locations in Kowloon were designated as "Hawker Accreditation Area" by the Hong Kong Government and Ladies Market was the first to be accredited. The market, located on Tung Choi Street in Mong Kok originally ran from the Argyle Street to Shuntang Street junctions with Tung Choi Street but was later extended further south to the junction with Dundas Street. Its name "Nui Yan Kai" (Ladies Market) is taken from its reputation for selling bargain fashionable ladies clothing and also to distinguish it from “Mens Market”, Temple Street Night Market (see above), although this is nowadays something of a misnomer and the market sells a huge range of ladies, mens and childrens clothes, sports goods, electrical goods, toys and souvenirs. Any “designer labels” are certainly fake but there are bargains to be had and huge discounts can easily be negotiated from already low asking prices. This is a large and for much of the time, a very busy market and navigating through the crowds here can be exhausting. The section of Tung Choi Street where the market operates is pedestrianised and closed to vehicles between 4pm and midnight on Mondays to Saturdays and between 12 noon and 10pm on Sundays and public holidays. Sections of neighbouring Sai Yeung Choi Street, Nelson Street and Soy Street are pedestrianised from 4pm to 10pm on Mondays to Saturdays and 12 noon to 10pm on Sundays and public holidays. OPENING HOURS - 12 noon to 11pm daily. Most stalls are open by 1pm. Traditionally, Ladies Market has been closed on the first day of Chinese New Year but on this day in 2014 it was reported that many stores opened. GETTING THERE – MTR to either Prince Edward and take exit B2 or to Mong Kok and take any of exits B2, D2 or D3. Prince Edward MTR Station and Mong Kok MTR Stations are at the northern and southern ends respectively of the market. Fa Yuen Street Market is a busy market which is primarily a market for locals but has become popular with tourists in recent years. 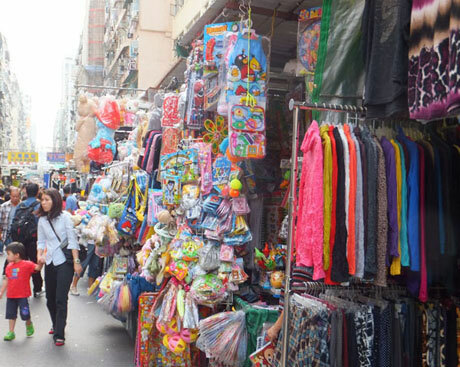 The market runs along Fa Yuen Street from Mongkok Road to Prince Edward Road in Mongkok and is famous for its factory outlet stores with well known Western brands, cheap footwear shops and young trendy fashion. A wide variety of other goods goods, including fashion accessories, toys, souvenirs, watches, electrical goods and fruit and vegetables. Many stallholders in this market only offer goods at fixed prices which are rock bottom although some are willing to bargain. There are also bargains to be had in the shops lining the street behind the market stalls. 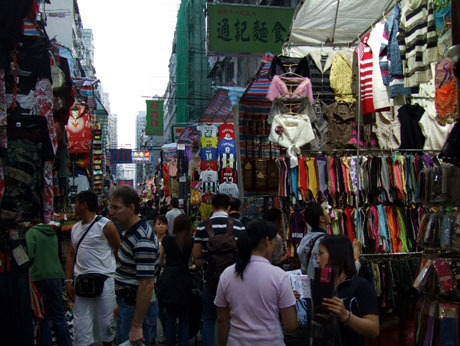 The market is very close to Ladies Market which is located along parallel Tung Choi Street, from its Argyle Street junction south to Dundas Street. In November 2011 a tragedy occurred when, during the night, fire broke out in one of the stalls in the section of market between Bute Street and Argyle Street, which spread to an adjacent building resulting in the loss of nine lives. 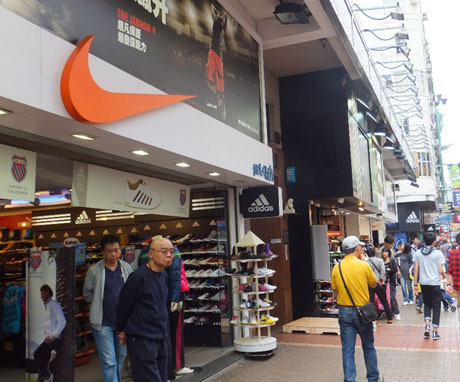 From its junction with Argyle Street, Fa Yuen Street continues south to Dundas Street and this section is known as "Sportswear Street" or "Sneaker Street" for the large number of sports footwear outlets located here. Many shops are under the same ownership and, whilst shops often offer discounts, prices are generally no more competitive than those in department stores and outlet shops. However, the range of goods is extensive, with all the latest designs being available, and retailers here will often throw in a small free gift with purchases. OPENING HOURS - About 10-30am to 10-30pm (some shops in "Sportswear Street" open later). GETTING THERE - MTR to either Mongkok Station or Prince Edward Station. From Mongkok Station Exit B3 the southern end of the market is about 3 minutes walk along Mongkok Road to its junction with Fa Yuen Street. From Prince Edward Station Exit B2 the northern end of the market is about 3 minutes walk along Prince Edward Road West to its junction with Fa Yuen Street. In the area around Sham Shui Po MTR Station, this busy market area comprised several "themed" streets selling a fascinating array of fabrics, fashion and fashion accessories, electrical goods and components, clocks, antiques, mobile phones, toys, household goods and computer hardware, software and accessories at rock bottom prices. 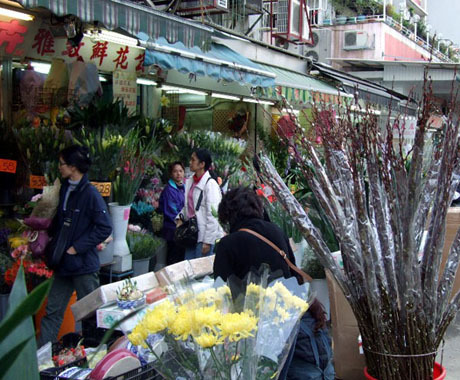 The market area, hugely popular with locals as well as tourists, is mostly contained in the streets within the boundary of Lai Chi Kok Road, Yen Chow Street, Tai Po Road and Boundary Street. "Fashion Street" (Cheung Sha Wan Road), from its beginning at the junction with Tai Po Road, approximately from numbers 2 to 260 on the north side of the road and from approximately numbers 171 to 269 on the south side of the road, and the surrounding streets contain over 250 wholesale fashion and textile shops, many of which sell to retail walk-in customers. 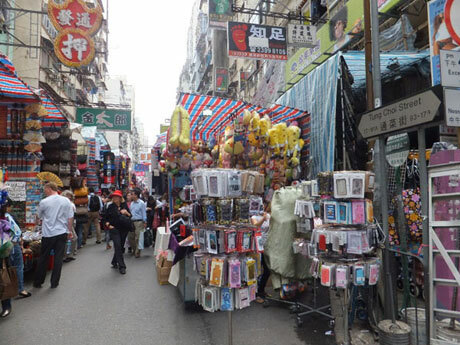 "Toy Street" (Fuk Wing Street) is lined with inexpensive toy shops as well as stationery and sportswear shops. "Bead Street" (Yu Chau Street), "Button Street" (Ki Lung Street) and "Ribbon Street" (Nam Choeng Street) and also Tai Nan Street are a crafters paradise with dozens of wholesale shops selling buttons, fasteners, ribbons, zippers, feathers, sequins and trims and other accessories of every shape and size at rock bottom prices. Walk-in customers are welcome at most shops. 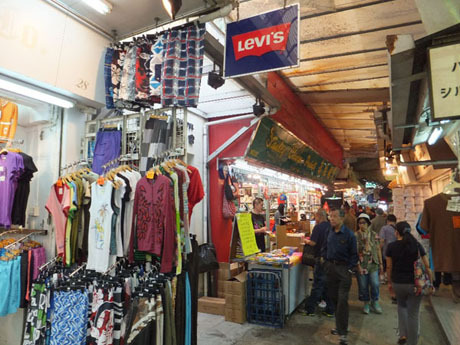 "Fabric Street" (Ki Lung Street and Yu Chau Street between Yen Chow Street and Wong Chuk Street) is a wholesale fabric market at which most shops also sell to walk-in customers. Also fabric market on Yen Chow Street. 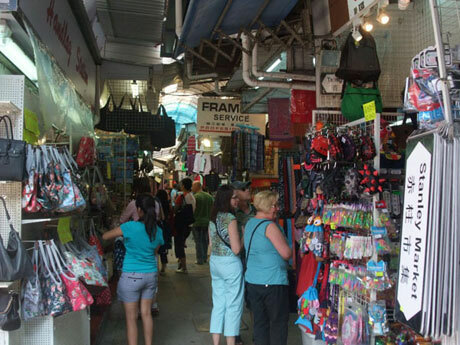 "Haberdashery Street" (Nam Cheong Street on either side of Cheung Sha Wan Road) is a large wholesale market. In addition to selling to trade customers most shops sell to walk-in retail customers. "Electronic Street", (Ap Liu Street) contains numerous cheap mobile phone, computer and audio visual product shops. Buyers should be aware of counterfeit goods and "switch and bait" tactics. 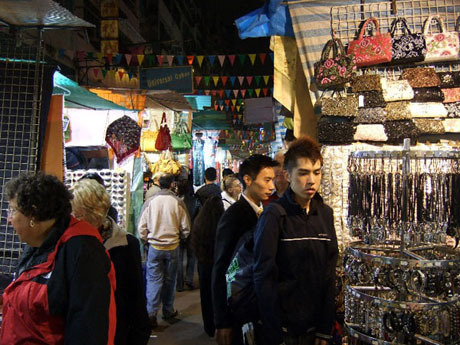 "Wholesale Gem Market" (Ki Lung Street between numbers 222 and 256 and Yu Chau Street between numbers 209 and 295). 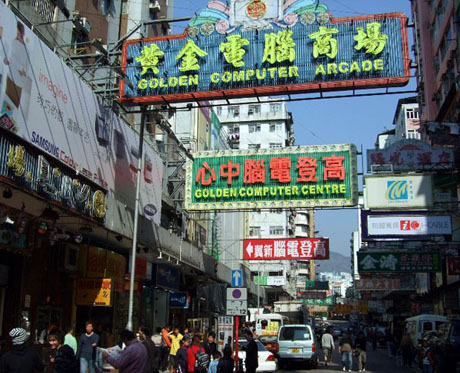 Golden Computer Arcade and Golden Computer Centre are two separate malls on Fuk Wa Street, and are a Mecca for computer buffs with dozens of shops offering computer sales, fast repair, data recovery, software and every conceivable accessory. Bargaining is the norm but beware pirated and poor quality merchandise. 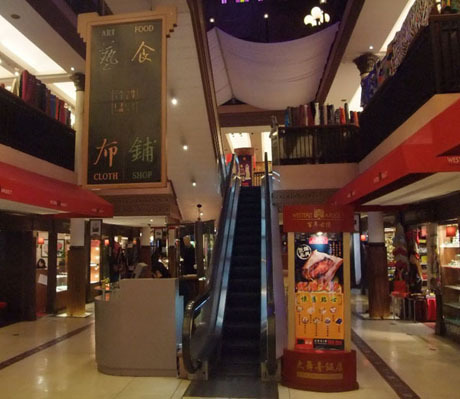 Dragon Centre on Yen Chow Street is a nine storey shopping centre with plenty of bargains and food outlets. Un Chau Street and Fuk Wing Street have several cheap Asian restaurants for those in need of sustenance. OPENING HOURS - Markets – Ap Liu Street Electronics Market noon to about midnight daily, Wholesale Gem Market 10am to 7-30pm daily, Golden Computer Arcade 11am to 10pm daily, Dragon Centre 10am to 10pm daily. Other markets generally open varying times from about 10am until 8pm to 10pm. Some wholesale shops close on Sundays and public holidays. GETTING THERE - MTR to Sham Shui Po. Exit A1, B1, C1 or D1 for Cheung Sha Wan Road. Exit B2 or D2 for Fuk Wing Street. Exit A2 for Yu Chau Street, Ki Lung Street, Nam Cheong Street, Apliu Street. Exit D2 for Golden Computer Arcade, Exit C2 for Dragon Centre. During the 1950's a group of jade traders from Guangzhou in Mainland China emigrated to Hong Kong and started business in shops on Canton Road in Yau Ma Tei. By the early 1960's there were only about 10 shops, but by the beginning of the 1970's the number of shops lining Canton Road from Jordan Road to Saigon Street had grown to over 100. Following US President Richard Nixon's visit to China in 1972, jade became a sought-after Chinese souvenir, particularly among Americans, and soon there were over 300 shops and street stalls in the area. 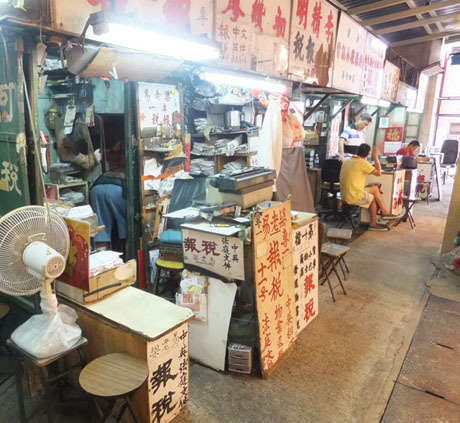 In 1984, in order to maintain better control, a site under a road traffic flyover was allocated to house all the street vendors and became the Jade Market, officially known "Yau Ma Tei Jade Hawker Bazaar". This is a rather gloomy indoor market on two adjacent sites, Zones A and B, on either side of Battery Street. There are 340 stalls in Zone A, the larger site, and 100 stalls in Zone B. 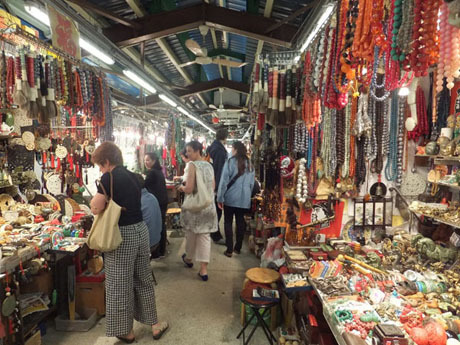 The market sells a vast array of jade products, particularly costume jewellery, figurines, beads, chopsticks and various souvenirs of various grades and colours with starting prices ranging from a few dollars to a few hundred dollars. For custom-made jewellery its advisable to take a photo of what is required. Buyers need to be something of an expert in jade to be able to judge quality and caution should be exercised in buying high value items. When purchasing make sure what goes in the box is what has been chosen and inspect carefully for damage. In Zone A, in addition to jade stalls, there are also 10 stalls occupied by some of the few remaining operators engaged in the ancient trade of letter-writing. These stalls offer a range of services including English and Chinese letter writing, Chinese calligraphy and completion of application forms and tax returns. An area of Temple Street Night Market (see above) around Public Square Street also has a number of Jade stalls. GETTING THERE – MTR to Yau Ma Tei. Take Exit C and walk south down Nathan Road and after passing under a road viaduct turn left into Kansu Street. 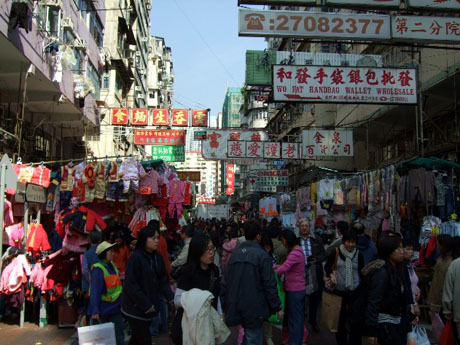 The market is located near the junctions of Kansu Street and Battery Street (fourth on the left) almost opposite the attractive colonial Yau Ma Tei Police Station. 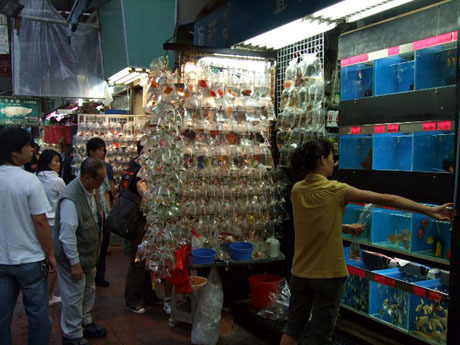 Located at the Prince Edward Road end of Tung Choi Street in Mong Kok the "Goldfish Market" also known as "Tropical Fish Market" is lined with shops displaying tanks containing much more than goldfish including dozens of varieties of fish including colourful exotic tropical specimens, seahorses, tortoises and jelly-fish. Food, rocks, plants, bowls, tanks and every conceivable accessory to keep a fish happy is available here. 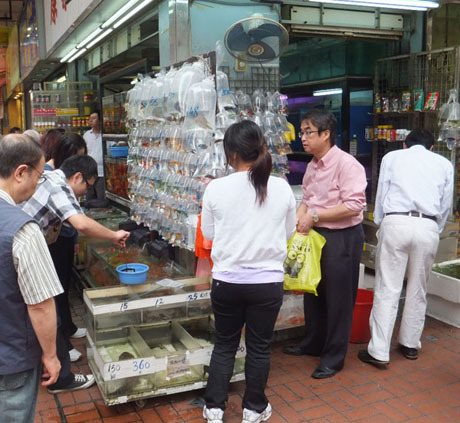 This is a popular market with locals as fish aquariums are believed to bring luck. The market is one block away from Fa Yuen Street Market. GETTING THERE - Take MTR to Prince Edward. Take Exit B2 and follow Prince Edward Road for about 50 metres eastwards to Tung Choi Street. This is a slightly more classy market dating back to 1906 located at Sheung Wan and is housed in a splendid building which has been restored both externally and more recently internally. The market has shops selling, toys, jewellery, watches and clocks, bus models and café’s. The first floor has shops spilling out on to the balcony selling a wide range of fabrics and textiles and there is a restaurant on the second floor. Unlike most other markets in Hong Kong this market rarely gets crowded and has a relaxed feel about it. GETTING THERE – MTR to Sheung Wan, take Exit B and walk west along Des Voeux Road for about 150 metres. Alternatively, from Central or anywhere on the tram route east of Central, take any tram with “Western Market”, “Kennedy Town”, "Whitty Street Depot" or "Shek Tong Tsui" as its destination. Citybus services 1, 5B, 18 and 26 also pass the market.